Smartphone growth is slowing down, voice searches are set to replace typing requests, e-sports viewing is growing exponentially, and Netflix now owns a large chunk of the entertainment industry. These are some of the takeaways from the Internet Trends Report released this week. 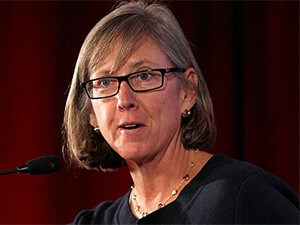 Every year, former Wall Street analyst-turned-technology-venture-capitalist Mary Meeker releases a lengthy report that is widely accepted as a look into the state of the Web for that year. Meeker, who is a partner at Kleiner Perkins Caufield & Byers, delivered the report at the annual Code Conference, which is currently taking place in Silicon Valley. The first major insight looked at global smartphone growth. It showed that in 2016, global smartphone shipments only grew by 3% as opposed to 10% the previous year and 28% in 2014. This while the global Internet user base had a flat growth rate of 10%. There are now 3.5 billion people connected to the Internet. Meeker noted that people are spending more and more time on their mobile devices; the average American now spends more than three hours per day staring at their phone. This time was less than an hour five years ago. In the last five years, the amount of time per day on average spent in front of a computer or on a laptop has been two hours. Mobile online advertising is accelerating while desktop advertising is decreasing slightly. In the US, $73 billion was spent altogether on online advertising as opposed to $23 billion in 2009 - of the $73b, $37 billion was mobile ad spend. Meeker says there is a $16 billion opportunity in the US for mobile ad spend as the amount of time users spend on mobile far outweighs how many adverts are appearing there. Radio, TV and desktop roughly equal how much time is spent on the mediums versus how many adverts appear on them. She predicts that within six months, the total ad spend on Internet adverts will outgrow total money spent on TV adverts. Facebook and Google own the biggest share of Internet advertising revenue. The report shows that mobile users are becoming increasing comfortable with voice input methods. Last year, 20% of all mobile queries were made via voice on Google Assistant. Meeker says voice could eventually replace typing inputs. She says voice input will increase as machine learning and understanding of words improves; right now, Google is doing a good job. Meeker says in 2016, Google reached a 95% accuracy, which is the threshold for human accuracy. The next major point looked at interactive gaming and e-sports viewing. She says there are now 2.6 billion online gamers compared to 100 million in 1995. She says gamers are not just teenagers; the average gamer in the US is 35. She gave several examples of how a lot of Internet tools and emerging technologies have roots based deep in gaming innovation, such as digital recognition, interactive storytelling, interactive learning, upgrades and downloadable content, and messaging. Meeker observes that interactive gaming could have been helping prepare society for the ongoing rise of human-computer interaction. She says gamification is currently influencing multiple industries such as healthcare, the military and work productivity. Streaming media services made their way into the mainstream in 2016. In the US, the main reasons people said they started paying for a music-streaming service was because the platform offered a free trail, the paid version was ad-free and they could access the music on their mobile. Global video streaming service Netflix now has 95 million paid subscribers and owns 30% of the home entertainment revenue. The company achieved this within 10 years. Traditional television viewing continues to decline. Meeker says digital subscriptions are rising due to massive user experience improvements. The 335-page slide deck presented at the conference is available here for full insights.